Well, it was a busy weekend here at the Donley farm! On Saturday, I baked lots of bread and rolls (using this recipe) so that we could have sandwiches on Sunday after church. We planned a full afternoon of working cows, so I wanted something quick and easy to make and clean up after. 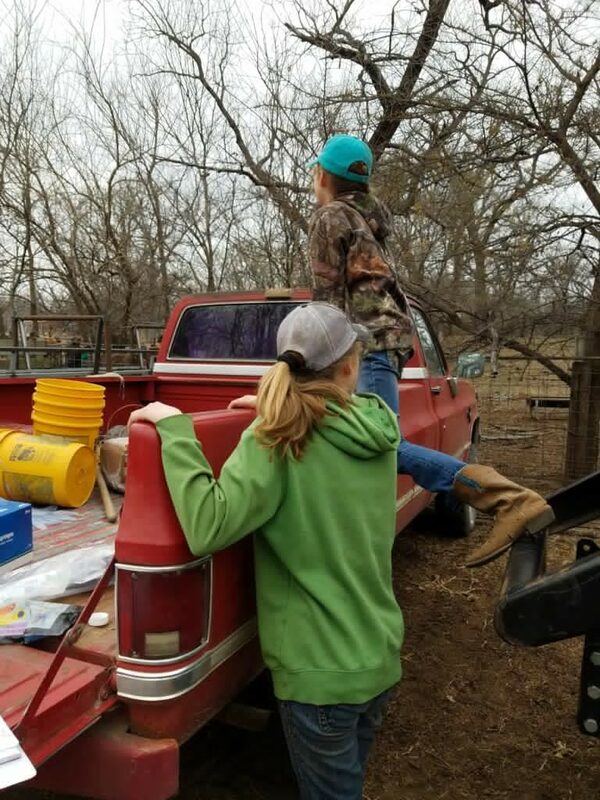 Here the girls were waiting for their dad and grandpa to push some more cows into the alley. We needed to stay somewhat hidden so the cows would walk into it. We headed down to the pasture and the fun began! We put the cows in this squeeze chute so that they don’t jump around and hurt themselves and us! 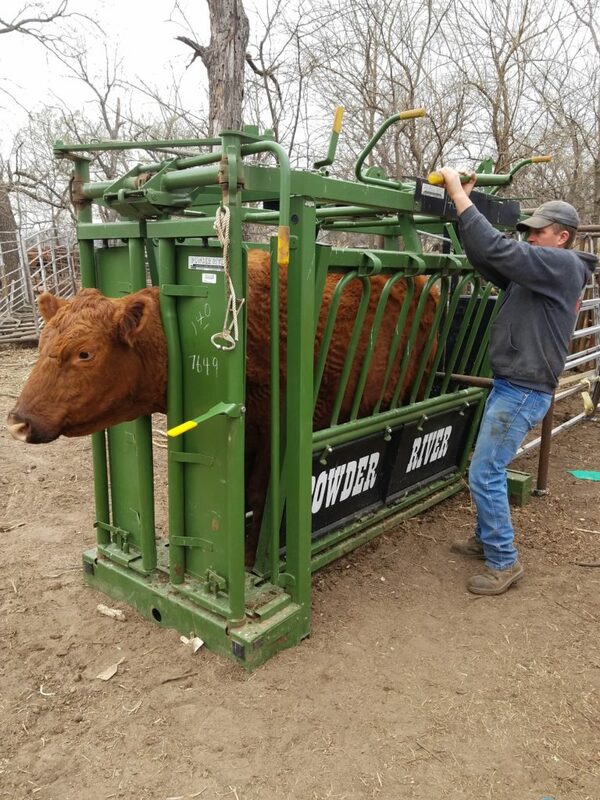 Our goal on this day was to re-tag them, check ages by looking at their teeth (our herd is very mixed and we needed to see if anybody needs culled), deworm them and de-lice them. Jeff gave them a worming shot and a lice pour-on, I took out old tags and re-tagged them, Elisa kept records of everything and kept syringes filled and reloaded the tagger, and Lindy played bovine dental hygienist and check their teeth (Jeff held their heads and I opened their mouths). It was all fun and games until this…. Yes, people, after 150 days or something with almost no moisture (we had small ice storm about a month ago, but that has been our only moisture since September! ), it actually started raining!!!! We still had 20 cows to go, so we finished them up an hour and half later! 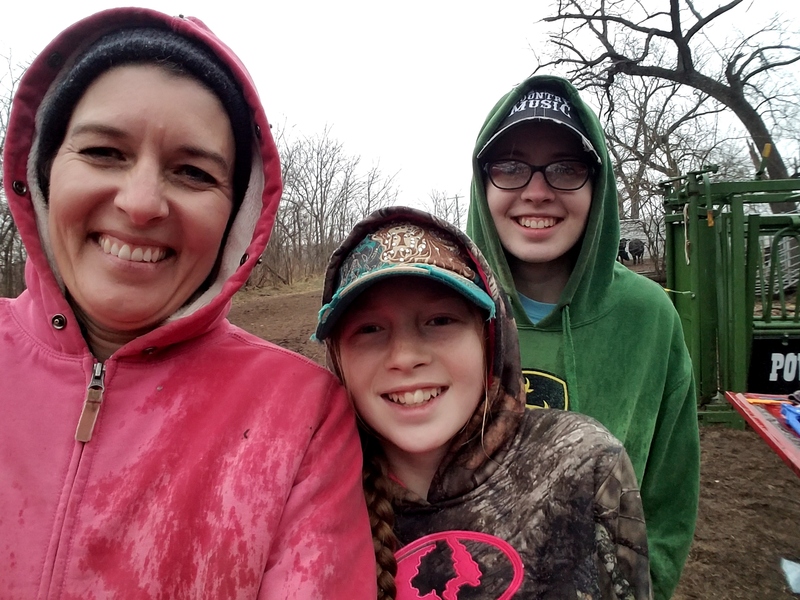 We were all chilled, soaked and muddy, but when you have all your mama cows penned up, you can’t just stop and wait for a later date and more conducive weather! On another note, notice Reece is missing from these pics? Well, we asked him if he wanted to come with us, but he wanted to stay home, and honestly, we were OK with that. He loves feeding cows, but to be down in the pasture with nothing for him to do for 4 hours is not his idea (or mine!) of a good time. Plus, we knew that we would all be busy and wouldn’t be able to exactly keep an eye on him. Plus, if he got to stimming too hard, he might spook the cows! That was our weekend, folks! On another very sad note- you remember this guy? 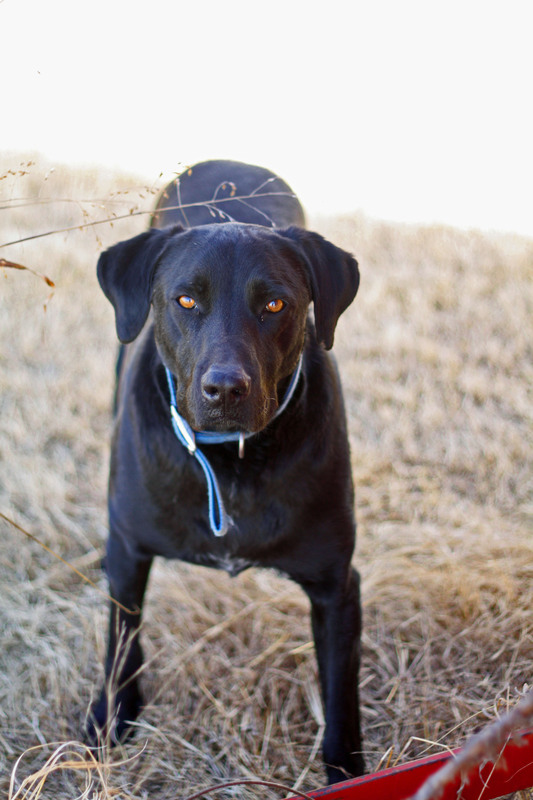 Joey, my in-law’s beautiful black lab? Well, he passed away last night. A neighbor accidentally hit him with his truck. Joey was a car/truck chaser and we knew it was a matter of time, but we all loved him. Elisa is especially devastated. Joey was her dog, too. She even did the 4-H dog project with him last year. All of you animal people understand, I’m sure. We love our animals and it’s so hard when we lose one! But, like Lindy said this morning, she just wouldn’t be happy if she didn’t have a dog to love. The risk of loving something is the pain you experience when they’re gone. On that note, I’ll sign off now. I hope you have a wonderful Tuesday! PS- I have a guest post up at Finding Cooper’s Voice. I’d love for you to check out this page! If you are a special needs parent or know one, this page is an awesome community!